"I'm telling you, the materials are the same, you know as well as I do. Anyways, while in the past they were used in an empirical manner, a way which did not allow them to work to the limits of their safety due to the fear of the unforeseen, on the other hand, our era, thanks to the experiences and mathematical formulas that it has deduced, is capable of unknown and daring constructions." Many creative minds have been said to be undisciplined in their youth. Belgian architect Victor Horta's biographers have even gone further, describing him as "lazy" and a "dunce" as a teenager. Apparently, Horta's father eventually had enough, and as punishment, at age 16 Horta was sent to work on a construction site. There, as he later recalled, he had an epiphany, and saw the rest of his life laid out before him. Indeed, Horta would go on to become one of his country's most accomplished and innovative architects, and one of the first following Belgian independence to achieve international renown, as one of the founders of Art Nouveau in the 1890s. Horta turned to Art Deco as his professional fortunes declined in the aftermath of World War I, and though he was later to receive numerous honors late in life, he had faded largely into obscurity by the time of his death, and several of his key works have been lost. In the last fifty years Horta's reputation has dramatically recovered and he is now recognized for being one of the world's key designers at the dawn of the 20th century. 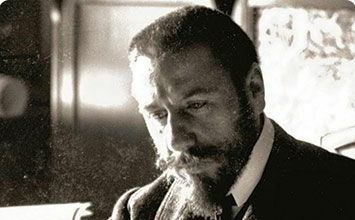 Horta is famous for his pioneering work in Art Nouveau and the translation of the style from the decorative arts into architecture in the early 1890s. Horta's inventiveness with Art Nouveau helped to make it something of a national style in Belgium by 1900 before its swift demise in advance of World War I.
Horta's work in Art Nouveau is marked by a keen understanding of the capabilities of industrial advances with iron and glass as structure and infill. Horta's buildings disclose an honest handling of their materials' properties, particularly the ability of iron to be twisted and bent into hairpin forms that extend seamlessly into the accompanying décor, inside and out, making the buildings "total works of art." Horta was an adaptable architect who transitioned from Art Nouveau to other styles such as Art Deco as public tastes dictated. Though Horta was respected during his lifetime for his brilliance with Art Nouveau, he himself predicted the style's own demise and that many of his works would be demolished eventually. 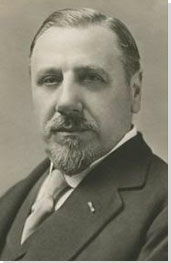 Victor Horta was born in Ghent on 6 January 1861 into a large family. His father, Pierre Horta, was a luxury shoemaker, who, according to Victor, "ran his studio with such an air of superiority that for him it became an art." Victor was attracted to music at a young age, learning to play the violin. It appeared to be one of the very few things he was passionate about; nonetheless, at age 12 he was first attracted to architecture when he helped his uncle on a building site. The Tassel House, often cited as the first Art Nouveau building. In this townhouse for one of his typical professional clients from the 1890s - in this case, one of his colleagues at the Université Libre de Bruxelles - Horta fuses the twin themes of nature and industry almost seamlessly. As with many of Horta's famed Art Nouveau residences, the heart of the building is the central stair hall, almost a foregone conclusion given the narrow urban lots that Horta was dealt for these commissions. Here, the emphasis is on structure, which Horta makes frankly clear in the dull green iron columns that anchor the space. The thin posts blossom into a tangle of tendrils and vine-like twists at their crown, which then blend with the vines evident in the mosaic floor and the stenciled whiplash curves of the plants on the wall surfaces. They are further echoed in the forms of the chandeliers that descend from the ceiling with flower-petal-shaped shades. The effect is that the exterior natural world (largely excluded from the tight-knit urban fabric of Brussels) is now permanently brought inside, with the soothing hues of green, orange, and yellow providing a respite from the bustling noise of the street. The stair hall is plainly visible on the exterior, with a riveted green iron I-beam serving as its foundation above the recessed main entrance before blossoming into a luminous set of stained glass windows containing the blues of water and pinks of flowering plants. In this way Horta creates a subtle play between nature and industry, with each complementing each other as essential components of the building. The crowning achievement of Horta's career was the Maison du Peuple (House of the People) in Brussels, the new headquarters of the Belgian Workers' Party. It was in many ways a temple of Socialism, as the Maison du Peuple was a common urban structure in several European countries. Maisons du Peuple provided various communal functions that often catered to working-class citizens: libraries, cafes, recreational spaces, bakeries, clothing shops, and a large auditorium for assemblies, along with offices for the local Socialist parties. Thus Horta's structure, the national headquarters for the party that represented the interests of a large sector of the population in highly industrialized Belgium, can arguably be seen as the apotheosis of the building type. The Maison du Peuple was a masterwork of design on several levels. In the first place, Horta had to fit the building into a highly irregular wedge-shaped site that occupied about a third of the side of a circular plaza. It was organized in a way that showed the progression from pedestrian activity on the ground floor (shops, food services), towards the offices of the Party and recreational spaces such as the library on the floors above, with the auditorium, the great assembly space for discussion, lectures, performances, and cultural and political enrichment on a mass scale, at the top. On the roofline, the building was emblazoned with signs bearing the names of individuals who had contributed to the Socialist cause, such as Karl Marx and Leon Blum. Aesthetically, it was a paean to industrial methods of construction: its iron frame was clearly visible everywhere on the interior and exterior, punctuated by rivets, with an interlaced network of iron beams forming the decoration on its ceilings. The infill consisted of either the pedestrian material of red brick or glass, reflecting a transparency of purpose. The inauguration of Horta's building in 1899 was front-page news in Brussels, with lavish posters being printed to advertise the event and the great French Socialist leader Jean Jaurès in attendance. Even in its demise some 65 years later, the Maison du Peuple highlighted the contemporary discourse about modern architecture, as it only was demolished amid massive global protests. Its replacement by a massive, aesthetically soulless concrete skyscraper has often been cited as one of the worst results of the modern redevelopment of Brussels in the 1950s and '60s that proved disastrous for Art Nouveau. The van Eetvelde House represents arguably the most daring and innovative of Horta's residences in Brussels, built in two primary stages; the initial one from 1895-98 and an extension constructed from 1899-1901. As in the Solvay House, Horta was given an immense amount of freedom in design, in this case, for Léopold II's minister for Congolese affairs. While the facade of the house discloses a kind of rationalist, industrial structure, consisting of an iron frame with large windows, adorned with the whiplash curves that had become Horta's trademark. Similar to the Tassel House, the significance of the building lies in its octagonal stair-hall at the center of the initial structure, whose metallic columns frankly reveal the unusual industrial frame of the residence. They branch out into flattened arches that support a large blue-green stained-glass ceiling, whose lower portions over the staircase employ Horta's exuberant, twisted curves that continue down into the balustrades and the rugs below, the furniture, and the grain of the marble around the inner walls under the stairs). Whether intentional or not, the effect suggests the modulation of light and shade and the tangles of vines and leafy foliage in the jungles of the Congo, the colonial territory that van Eetvelde administered. More directly, the combination of the spiral of the staircase and the web-like decor implies that the residents of the house are firmly enfolded within nature's grasp. These motifs are extended throughout the furnishings of the rest of the house - in pieces as diverse as the fireplace and the lighting fixtures - emblematic of how the residence comprises a total, seamless work of art that acts like a lush oasis from the urban environment. Horta thus arguably exploits and appropriates the natural imagery of the Congo for the pleasure of his patron, though with much less sinister undertones than the way his patron's administration of the Congo - King Léopold II's personal fiefdom - exploited its native residents to near-genocidal proportions for the profitable harvest of natural resources. Horta's own house and studio are now home to the Horta Museum and constitute an important example of his surviving work. Its significance lies primarily in the way that it acts as a superb piece of rationalist architecture, expertly communicating its function and serving as an advertisement for Horta's own forward-looking architectural practice. At ground level, the house catches the viewer's attention with the sinuous curves of Horta's signature ironwork and the I-beam used as a lintel over the double window left of the main entry, hinting at the house's industrial methods of construction. This subtle move is brought to full fruition on the interior with the frank exposure of the iron frame, particularly in the dining room, where Horta has unusually chosen the industrial material of white glazed ceramic subway tile to cover all the surfaces of the walls and ceiling. When the viewer looks upward from the street, she is immediately struck by the demonstration of the remarkable tensile and structural properties of iron, Horta's signature material: a delicate iron balcony whose posts extend upwards into sinuous corbels that astonishingly supports an entire stone oriel that bulges outward into space from the plane of the facade, thereby suggesting both Horta's own daring and genius as a designer. Finally, once the viewer glances over to the right of the projecting bay, he notices the huge curtain wall topped by a skylight that signals a studio, indicating that the inhabitant is himself the residence's designer, whose perch on the top floor suggests he is fully in command of his craft. Inside, this sense of exclusivity can be seen in the spiraling staircase that terminates at the top in a brilliant tangle of sinuous metal structure under a skylight of white-and-gold-colored glass. Having climbed the trunk of a tree and finally reached the canopy, it is as if one now sits ensconced amongst its leafy branches and shielded from the bustle of activity on the levels below. Horta frequently designed all of the aspects of his buildings, including large amounts of furniture, and was a talented interior designer. The press praised his dining room ensembles shown at the 1902 First International Exposition of Modern Decorative Art in Turin, where Art Nouveau was featured nearly to the exclusion of all other styles. The Aubecq House (since demolished) was one of Horta's residences to feature furniture designed by him. This chair is typical of his designs from the turn of the century, with the crown of the back that flares outward and a frame that entirely eschews straight lines. The thick structure of the chair and the sinuous curves exude a sense of natural energy whose forms seem to be held in tension, kept in check by the counter-push of the other members. They mirror the whiplash curves of Horta's architectural elements that likewise convey a sense of living, stretching energy, which is underscored by the warmly-colored ash. Alternatively, one could read the bulging forms of the back and arms like the abstracted outlines of petals of a flower in full bloom, opened to receive the seated human form, thus also complementing the ubiquitous plantlike imagery of Horta's interiors that seem to enfold the residents of his houses in nature's grasp. Horta was commissioned to design several department stores during his career; virtually all of them were built in a very short period between 1901 and 1906. The branch of L'Innovation that he constructed in Brussels at 111 Nieuwstraat is the best-known and most innovative of these. In it, Horta pushed the skeletal, tensile metal structure to the limits of its capabilities, exposing it to the elements with the simple infill of glass panels on the facade. The result is that the entire facade functions as one massive shop window, allowing everyone outside to see in, and vice versa. In addition to creating a massive advertising display of the store's wares inside, the full glass facade - which stands out among the conventional stone-fronted buildings around it - communicates a sense of transparency and honesty to potential consumers, as if the store has nothing to hide. This sense of honesty is further communicated by the seamless, light use of iron for the interior structures of gallery levels around a central atrium, thus allowing customers and employees alike to survey nearly the entire store while inside. On the other hand, the building appears like a massive, glittering jewel box, with the added light from the all-glass facade adding an aura of brilliance to the items for sale inside, as if they were wrapped in a gleaming package, thus magnifying their appeal beyond their mere usefulness as ordinary commodities. Unfortunately, in later years renovations to the store covered Horta's original curtain wall of glass with opaque panels, and the building eventually burned to the ground in a spectacular fire that took the lives of 322 people in May 1967; it was demolished shortly after. The Palais des Beaux-Arts, often fondly called "Bozar," a play on the pronunciation of the last half of its French name, demonstrates Horta's conversion from Art Nouveau to Art Deco as the latter garnered followers as a modern version of classicism in the years following World War I. It is a large complex that serves several different functions, and not surprisingly it took nearly ten years to complete. Horta worked on an irregular, sloping site, whose ground was generally sandy and wet, and was subject to several constraints. Most notably, he could not build more than three stories, in order to preserve the view from the Royal Palace towards the center of Brussels; and he had to create street facades that allowed for the insertion of individual shops, a feature he considered unworthy of a structure called a "palace." Horta in part solved the height problem by locating many of the required spaces underground. The exterior is characterized by the interplay of cubic and rectilinear volumes in repetitive bays on the street facades, punctuated by a circular entrance pavilion distinguished by massive, severe paired Doric columns that extend the height of the upper two stories. The interior at ground level is organized along a wide corridor that extends parallel to one facade and terminates in a grand auditorium that seats 2,200 people and serves as the home for the National Orchestra of Belgium. The building also contains several other small theaters and performance spaces, a sculpture hall (now named after Horta), exposition galleries for the visual arts, and a cinema. Horta was awarded the commission for Brussels' new central railway station in 1910, but delays caused by the two World Wars, logistical problems caused by track access, and funding constraints meant that Horta would not live to see the completion of the structure, which his student Maxine Brunfaut saw through at last in 1952. The greater part of the design was worked out by Horta in the 1930s. Part of the biggest challenge before Horta could begin designing the structure was the determination of where the heavy rail lines that would connect Brussels North and South stations - until the 1950s the twin termini of all intercity trains - would run through the center of the city. Horta again dealt with a difficult, irregularly shaped, and sloping site. His solution was to construct a lozenge-shaped building, with one long facade that fronted the Cantersteen, with a street-level overhang to welcome passengers arriving by car. The opposite side facing the Carrefour d'Europe, which extends one level below the street grade, employs a large concave facade whose upper levels are distinguished by a multistory curtain wall. Each of the entrances from the two facades leads into the large, monumental central concourse that branches off to the intercity train platforms and subway station below ground. Horta has designed the Cantersteen facade in an unbroken rhythm of repetitive bays with minimal ornamentation, while the corners of the station use a gentle curve that makes the building's form resemble the image of a streamlined train. Today, however, the station is undergoing studies for how to best handle the massive passenger traffic it receives - though not even designed to handle 70,000 users daily, on some days it welcomes upwards of 150,000 passengers - and so its future configuration remains uncertain.